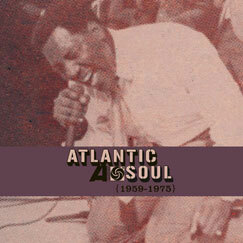 Rhino Handmade is celebrating the 60th anniversary of Atlantic Records with a series of 4-CD boxsets devoted to the label’s different musical styles, including this new Atlantic Soul 1959-1975 CD boxset. Opening with Ray Charles’ Come Rain Or Come Shine and closing at the dawn of the disco era with The Trammps’ Hooked For Life, the 82-track collection takes in R&B, soul, funk, gospel, Philly and much more besides, including the likes of Brother Ray, Otis Redding, Aretha Franklin, Solomon Burke, The Coasters, Sam & Dave and Wilson Pickett through to less mainstream acts like Judy Clay, Baby Washington, and the Soul Brothers Six. Compiled by R&B expert Billy Vera (himself an Atlantic artist), it all comes in a sepia-toned 12” x 12” box that includes a booklet filled with extensive liner notes and rare photos. And it’s limited to just 3,000 copies, all numbered. If you want one, you can pre-order from Rhino for a price of $79.98 (around £40).